The word coca comes from the aymara word “q'oka” that means food for workers, for thousands of years it’s been a fundamental element on the day life and religious rituals of many indigenous cultures in South America. 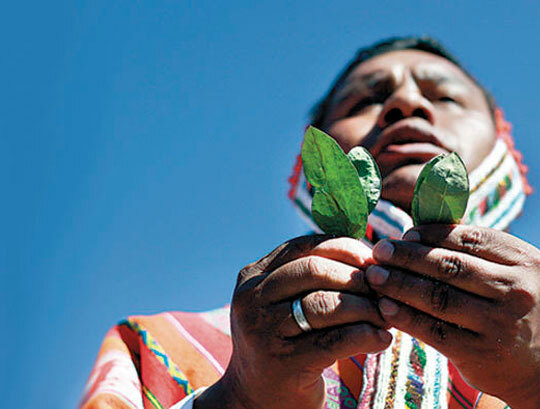 Chewed with lime, which serves as a catalyst, its leaves release a mild dose of alkaloid, alleviating hunger, pain, thirst, and even supply some vitamins otherwise absent on the diet of the people who life in the highlands. 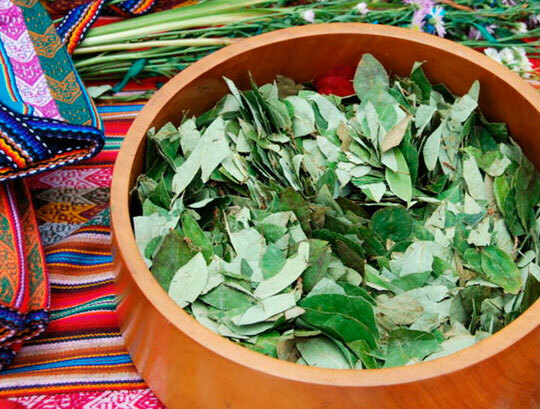 A legend tells the story of Peruvian mother Quilla, goddess of the moon, which scattered the sacred bush in warm places obeying the sun’s orders, Inti, so that its leaves can relieve fatigue and hunger of its elected Town giving them strength. Under the government of the Incas, the coca was revered as a gift from the gods and their production and distribution were strictly controlled by the state. 8:30 a.m. Pick up from the Hotel. 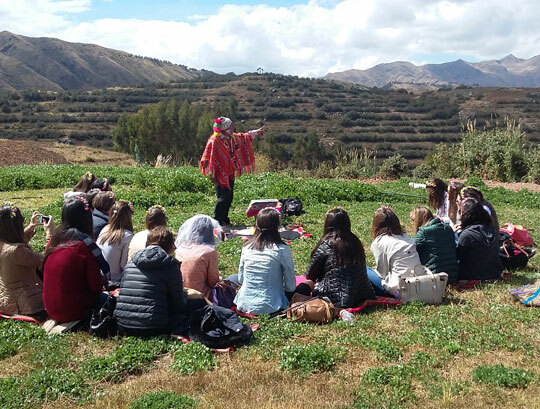 We will go to Planetarium, it is a place located 3 kilometers from Cusco City, where there will be waiting for us the Paqo (Shaman) We will be able to share an unforgettable experience. Return at about 10:00 a.m. 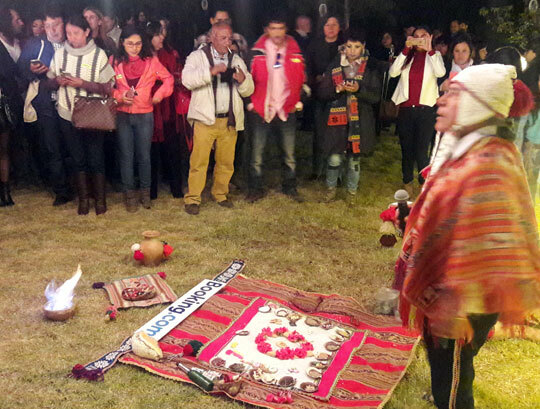 This Inca ritual, which lasts even among people of the Andes, it is made with the idea of thanking the mother earth for everything that we have as a sign of reverence and paying her back for all the crops and the food that is given to its people and animals. At the same time through this ritual the people can ask the mother earth for favors, or be always kind with them, their needs such as hunger or thirst, so the Ayni (Quechua word that means today for me, tomorrow for you - TRADING) can be done. Everything had to be in harmony, and if something happened it was because this harmony was broken on the spiritual aspect, and to correct this it was necessary the assistance or help from the Apus and Mother Earth, that were considered alive gods for this reason they were able to go through needs of hunger, thirst, and they reached the offerings. One of the most important deities of the Incas was the Moon, called Mama Quilla, who was the Intis´s sister and wife ( Inti – Sun), She accompanied the god Inti in equal rank in the celestial court, She was the sky´s mother, She was the female side of the universe, She had influence over the tides, growing of the plant, fertilization ... The Incas built, lunar calendars, temples dedicated to their deity, one of them is the amazing place located 1 ½ hours from Cusco City. Go ahead and know this sacred place, full of mystery and enigmatic place for meditation and the realization of an offering to the Mother Earth. 9:00 a.m. pickup from the hotel and transfer to the Lunar Calendar of Quillaro the motherumiyoc. 13:00 p.m. Rest and box lunch. 14:00 p.m. Back to Cusco.